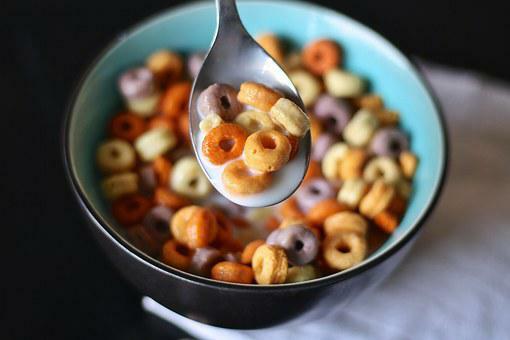 There’s absolutely not any question that cold cereals revolutionized the American breakfast table. No longer did mom have to cook hot cereal, eggs or meat, and children could independently prepare something for themselves before heading off to school. At the turn of the twentieth century, the creation of cereal basically began with two enterprising men who saw the possibilities and took a gamble. And breakfast has never been the same. From the late 1890s, a somewhat eccentric man named John Harvey Kellogg, ran a health sanitarium at Battle Creek, Michigan, and had created a bland, tasteless food for his patients with digestive troubles. A few years later, his brother Will decided to mass-market the new food at his new company, Battle Creek Toasted Corn Flake Company, including a bit of sugar into the flakes recipe making it more palatable to the masses, and a star was born. Around the same time, C. W. Post, who was a patient in Kellogg’s sanitarium, introduced an alternative to java named Postum, followed by Grape-Nuts (which don’t have anything to do with either grapes or nuts) and his version of Kellogg’s corn flakes, naming them Post Toasties, and America’s breakfasts were never the same. Both guys could thank an enterprising gentleman by the name of Sylvester Graham, who twenty years before had experimented with graham flour, marketing it to aid”digestive problems.” He created a breakfast cereal that was dried and divided into shapes so hard they had to be soaked in milk overnight, which he called granula (the father of granola and graham crackers). Shortly Cheerios appeared and could become the best-selling cereal in America, worth roughly $1 billion in sales in 2015. Nobody can dispute the convenience and flexibility of dry packed cereal. In the last fifty years, this multi-billion dollar industry has spun off multiple applications, unlimited possibilities and targeted kids with clever packaging, outrageous names, flavors, colors and choices (all loaded with sugar of course).